Launching Special! 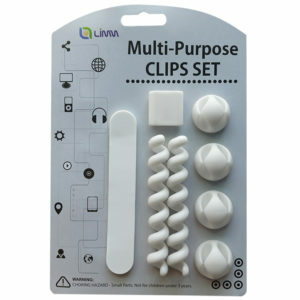 Try out our new Multi-purpose Adhesive Cable Clips Set, which is a cord organizer solution for Desktop, Tables, PC, Office and More. *Check out the images in our amazon.com page to have a better idea of how to use them. This unique set of cable clips can be adhered to any smooth clean surface such as tables, walls, windows, metal, rubber, etc. Your silicone cable holder clips are tough enough to secure your cables in place and soft enough to remove your cables easily when needed. The different cable clips all have different uses. Don't just organize your cables, go ahead and do a lot more! This offer is only for the first 20 Customers to get in touch.